Hi everyone, I wanted to share a boy version of the Baby Bear stamp set, so cute. This is for one of my nephew's birthday coming up in July. For the card I used the night of navy cardstock, for the stripey background I used some left over DSP I had in my stash so you could just use what you have, the ribbon is retired but you could replace it with either the new Dapper Denim Ruched ribbon or the mini TipTop Taupe Striped Ribbon. For the teddy I used Tip Top Taupe, Crumb Cake and Sahara Sand Ink Pads in that order. I have found working backward with the 3 step stamping works best for me, eg darkest to lightest, I also stamped of once for the Tip top Taupe and the crumb cake and full strength for the Saraha Sand. For his bow tie I used Dapper Denim, stamped of once and them full strength and a few pearls. I used an oval framelit which is from the old set not new and for the corners I used the curvey punch (which is also retired) I don't know why they retired that punch as all the ladies in my classes love to use it and I use it all the time too, hopefully they might bring it back. 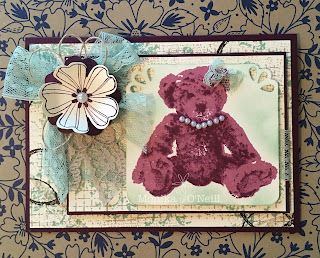 I hope you get a chance to have a go at making a Baby Bear card they are versatile and fun to create. Have a great day and see you soon. Happy Crafting!! 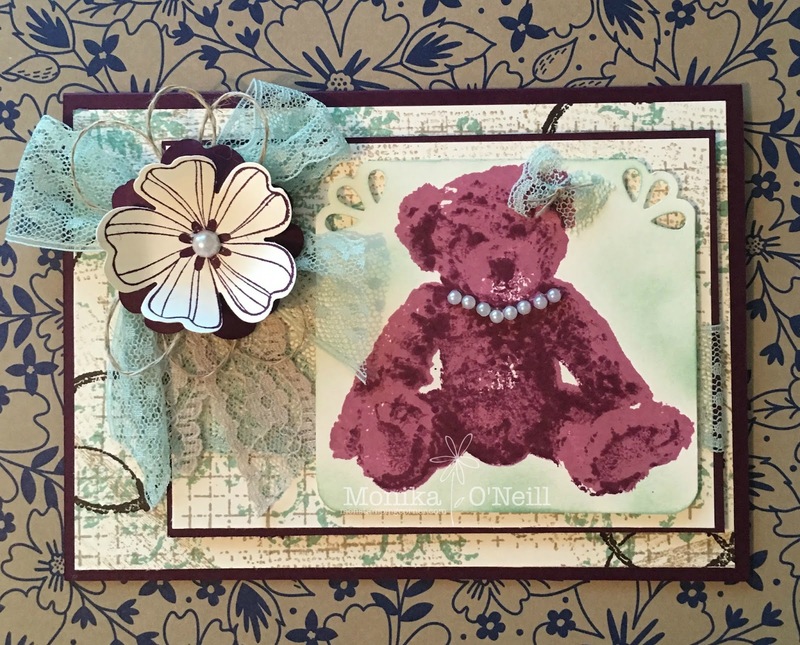 Hi everyone, thought I would share this card that was made in my card class on Wednesday night using the Baby Bear and Timeless Textures stamp set, I love the vintage look of this card. It has a few layers going on which adds character. If you are interested in knowing how to make this card just let me know and I will forward the instructions. Listed below are the products you need to make this gorgeous card, for any stock you might need just click on any of the items and it will take you directly to my shop, nice and easy. Thank you for looking and stopping by. Will see you soon, have a lovely day and happy crafting. You can also follow me on Facebook at 'mons crafts' where you will find me most days.